When Sarah packs up her precious Christmas glass, a set of twelve traditional Italian ornaments, during WWII and sends them to her cousin Filomena it is with the understanding that they never be separated. Filomena guards them carefully until one Christmas she discovers one is missing. She is filled with anguish until her husband suggests she give them away to keep her family together. And so we have The Christmas Glass a story told in 12 parts, each section the story of one person with the glass. These are the lives of 12 very different people, including Filomena's estranged daughters. In fact, Filomena makes an ultimatum that in order to move into an assisted living center like her daughters wants, she would like to see them together for Christmas. I really enjoyed this book. It is international, it tells the stories of 12 different people each carrying around their grief and uncertainty and I love the way their lives connected in simple but profound ways. It's filled with sweet hope without being sentimental or sappy. It's not about a perfect Christmas, but it is about taking small steps toward reconciliation and forgiveness, which makes it incredibly satisfying emotionally. I felt like the characters were well fleshed out full of flaws but also very likeable. Really I can't say enough good things about this book, it's the best holiday book I've read so far this season, and is a definite keeper. Having said that, I do think it's entirely possible this book could be enjoyed year round. Things You Might Want to Know: This is technically Christian fiction, which means in this book, they go to their pastors for counseling, etc. Nothing preachy or didactic in it. This sounds like an absolutely perfect book to read for the holidays. Time to get our hearts and minds out of crime and end of the world stuff and lift ourselves up! That does sound like a sweet story. Glad you enjoyed it. This sounds wonderful, even though I am not religious. I love a good christmas story, and this one combines 12!! :-) I'll look forward to getting my hands on this. This sounds like a really great read. 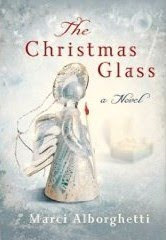 I love Christmas books that can be enjoyed year round. Even more, I'm really intrigued by the description that you gave. Definitely adding this to my TBR list and hoping I can get around to reading it this holiday season.